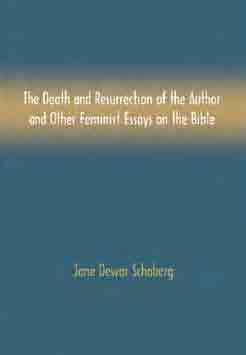 Jane Dewar Schaberg (1938–2012) is widely recognized as one of the foremothers of feminist biblical studies in North America, best known for her ground-breaking and controversial works, The Illegitimacy of Jesus (1987) and The Resurrection of Mary Magdalene (2002). The present volume brings together fourteen of her essays on feminist approaches to scholarship and teaching, studies on women in the Christian Scriptures, feminist scholarship and modern media, and responses to backlash against feminism. Many of these essays appear here for the first time. Included also are several of Schaberg’s important essays on Mary Magdalene as well as new essays in which she explores further her proposal for ‘Magdalene Christianity’. These studies will be of interest not only to scholars, but also those teaching courses on women and the Bible, women’s studies, religion and media, and the history of early Christianity. A distinctive feature of this volume is the way in which it honors the feminist commitment to acknowledging the voice and presence of the author in the text. Each of the five sections is introduced by a brief autobiographical sketch that invites the reader to hear the essays in dialogue with the context of Schaberg’s life. These sketches offer the reader a glimpse of the values, commitments, and struggles that are the substratum out of which the scholarly essays emerge. Also woven throughout the volume are several of Schaberg’s poems, providing commentary on the essays and drawing them into conversation with Schaberg’s life experiences. Together, the essays, autobiographical sketches and poems speak to the importance of claiming one’s own voice and identifying absent voices in the texts. They also speak to the importance of recognizing the context(s) in which one reads and writes, and the need to uncover the hard realities that silence many voices within those contexts. The volume is, in short, a stunning and remarkable representation of a life dedicated to feminist scholarship. For those who read it, it is also a call to action. Jane Dewar Schaberg was Professor of Religious Studies and Women's Studies at the University of Detroit Mercy. Holly Hearon is J. and Virginia Liggett Professor of Christian Traditions at Christian Theological Seminary, Indianapolis. The volume is a treasure in exegetical scholarship, feminist voice, and personal honesty … [T]he academic and feminist communities lost a great Bible scholar and feminist thinker deeply concerned about the origins of the Christian movement, women’s places in it , and how these origins reflect on ongoing gender injustice in society, culture, and religion . The poems and Schaberg’s personal voice shining through the fourteen essays ensure that our minds and hearts are touched whenever we pick up this book. We need to assign it to the next generation of undergraduate and graduate students … They will appreciate her work, helping them to see “something of the past that was not silenced, and something happening in our own very interesting, crucial time” (215). Schaberg’s voice is resurrected. Susanne Scholz, Review of Biblical Literature.